DuPont™ introduced their “Dare Bigger” campaign at the 2015 Winter X Games. Many of the athletes’ protective gear included DuPont™ Kevlar®. 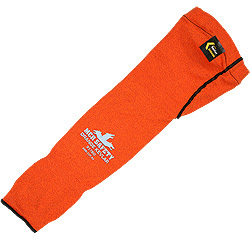 Our orange Kevlar® sleeves feature a patent-protected, high visibility orange DuPont™ Kevlar® engineered yarn. The high visibility orange enhances safety awareness. Additional features include thermal protection, durability, strength, and protection from sharp objects. This light weight seamless shell provides dexterity and comfort. Applications for the orange Kevlar® sleeves include cut hazard environments such as; advanced manufacturing, automotive industry, light heat applications, glass operations, metal stamping, sheet metal and even law enforcement. When extreme is not a sport it’s your job, our orange Kevlar® sleeves is the gear of choice for the industrial athlete.